Do you know that the kids’ bed is a lot more than just their sleeping space? It could be a den, a place where they can do their homework, store their toys and do a lot more. Because of the increasing land prices across Pakistan, the trend of moving to smaller homes and apartments is peaking among families, as a result all-in-one beds are gaining massive popularity. However, everyone has different preferences no matter whether they are living in a small house, apartment or even in a big house. Furniture manufacturers are well aware of this fact. In fact, to cater diverse needs of customers they have made an extensive variety of children’s bed available in the market. Most of these beds are designed to save space and be more functional. This guide by AmerAdnan® would help you buy the right kids’ bed for your little angels. If you are a family of parents and kids with space restrictions, there won’t be a better idea than to opt for the bunk beds. 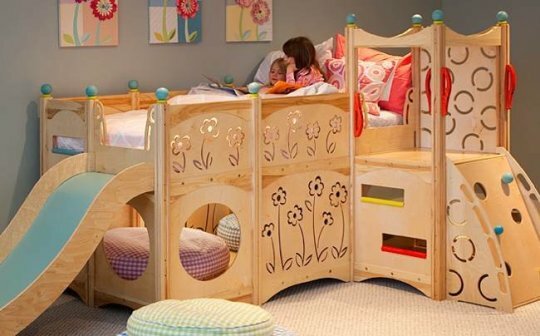 It’s a great way for your children to share a bedroom while having their private sleeping space. The bunk beds can also be split into separate single beds as your kids get older, making them practicable for longer period. Majority of the bunk beds have a stair to get to the upper compartment, however some even have a slide that kids can use to come down or to have fun. As the name suggests, this bed is more suitable for a single kid. They are constructed just like the double beds, but in a smaller size with vivid colors and adornments they make an attractive and compelling bed for kids. The conventional single beds are constructed in regular shapes with bright colors painted onto them. In contrast, customized single beds are made in the shape of cars, space shuttles and many other objects so they can be more appealing and appropriate for younger children. These beds have special cabins made below them to fully utilize the space underneath. The drawers or cabinets in these beds are used for storage. From kids’ clothes to toys, you can store just about anything in these drawers. The cabin beds are a great space-saving solution for smaller homes that do not have enough space for placing cupboards or installing wooden racks. The sleep-station beds are all-in-one solution for all your kids’ needs. They are not just the space where your kids would go at night to sleep. In fact, they can be used for different purposes as it incorporate drawers, storing spaces together with a piece of furniture. The bed is usually reached by a ladder. With these beds, your child can study, play and sleep at the same place now. Most of all, this bed can be easily placed in the smallest room. Whereas storage space in it could be utilized for placing your kids’ toys, stationery, books and clothes. What more you can ask for?